I am always happy to return to Liguria, the land in which my wife was born, and where I feel at home, as if I had been adopted. It has not to do only with the sea; the Ligurian land lives half way between reality and fantasy. A land with hard-working people and dreamlike landscapes, with whitewashed walls crawling all the way down to the sea besides the flagstone-paved «crêuze». Town centres with their typical endless «carruggi» full of perfumes beckoning you to go discover, or again colourful and tasteful foods with strong-sounding names: fugàssa, gianchetti, fainà, pignêu. One walks round a dark corner at the border of a square, and is blinded by a dazzling light, with the strong scent of the sea at hand. One more corner, and under one’s feet is a «rissêu», of breath-taking beauty. This form of pavement, typically Mediterranean, can be found in many places, both in Italy and in Greece; but in Liguria it is a living, unique tradition. The «rissêu» was originally made for courts and gardens. In this article (by Luciano, author of the artwork in the picture) we see how this form of art can be used indoors, with a most original effect which transform ordinary places into something that is one of a kind. Rooms, in which people took care of their bodies, were decorated in mosaic already at the time of the Romans – if not earlier. Two examples that stand out, are the Thermae of Caracalla in Rome, and the Bath of Neptune in Ostia Antica. Mosaic is the real master of space in these two places. Mosaic coatings were used for both decorative and practical reasons. 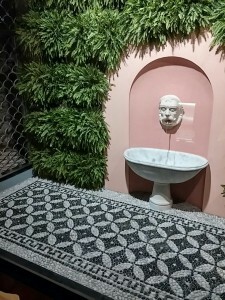 On one side, baths needed to comply with requirements of hygiene and cleanliness; mosaics allowed for clean environments, in which good conditions for continuing usage could be achieved with little maintenance. 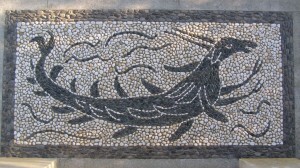 On the other hand, mosaics carried visitors literally into worlds of fantasy, often by using imagery inspired to the animal world of sea or land. Mythology of its age was widely represented, joined with geometric and floral motives. One possible practical application of mosaic – of which the Romans had not thought – is the rebalancing of the organism through self-massage of the foot soles. The easiest way is to walk along a stretch of mosaic consisting not of flat polished stones, but rather on pebbles: precisely our Ligurian «rissêu». Romans had little consideration of this mosaic technique, which was deemed outdated, in favour of the more «modern» cut-stone technique. Greeks however still used it widely, and pebbled courts were much more frequent: the ones that at present day are called «votsalotes», and at the time «lithostrotos». John’s Gospel tells that there was one in the palace of Pontius Pilate, too. One wonders whether the ancient Greeks used to walk barefoot on such mosaics, and reaped the benefits of self-massage. We need to introduce the concept of foot sole reflexology. Foot massage can prevent and cure many pathologies of the body. Unfortunately, our feet are also that part of our body which is ignored and neglected by most. Foot sole reflexology is a very well known alternative therapy, rooted in the Eastern techniques of self-massage such as the Shiatsu in Japan, or its Chinese equivalent Tuina. It can promote relaxation, improve blood circulation, reduce pain, soothe tired feet, and help heal the whole body. The massage is performed with both thumbs on the soles of the feet; it helps rebalance energy and well-being in the body. The soles of our feet hold numerous nerve terminations, and by stimulating the appropriate ones, we can get to feel better. Possibly the mechanism of foot sole reflex is similar to the one of acupuncture: by stimulating specific points, we induce the brain to release chemicals that help reduce the perception of pain. 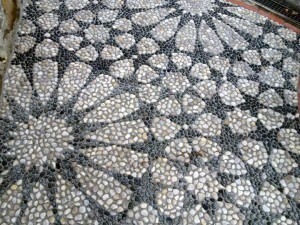 There is another option to self-massage, besides the direct action of hands on feet: that is, walking on pebble mosaics. The roundness and smoothness of the pebbles performs precisely the kind of pressure needed to achieve a natural massage of the soles, just by standing on the bare feet. By walking shoeless on these surfaces, all areas of the sole will be stimulated, thus bringing wellbeing to the whole body. The mosaic’s graphical and artistic tone, by placing meditative and contemplative images before the eye, will extend its beneficial effects to the mind. In this way, the home wellness room – for those who can afford one – becomes a place of rest and relaxation, and also of self-therapy and physical wellbeing. 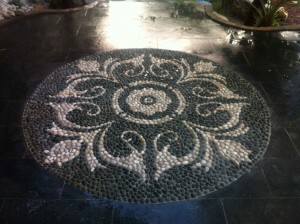 A pavement in pebble stone mosaic can be placed in a fitness centre or a spa, or outdoors by a swimming pool. It can consist of a single surface, made of more or less regular shapes, or it can wind along a path. 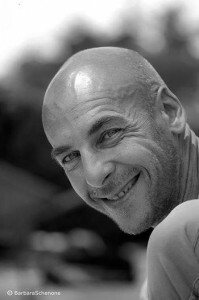 Luciano Bonzini lives in Genoa, where he makes mosaics in the traditional technique of «rissêu», described in this post. Since 2015 he partners with Musiv’Arte for activities in Switzerland.